Specifies the person’s role at the organization in broad categories such as student, staff, employee etc. Permissible values are: faculty, student, staff, alum, member, affiliate, employee, library-walk-in. These are arranged in a hierarchy (as shown in the figure to the right). A student/pupil will have the values member and student. An educational employee will have all the values member, employee and faculty. 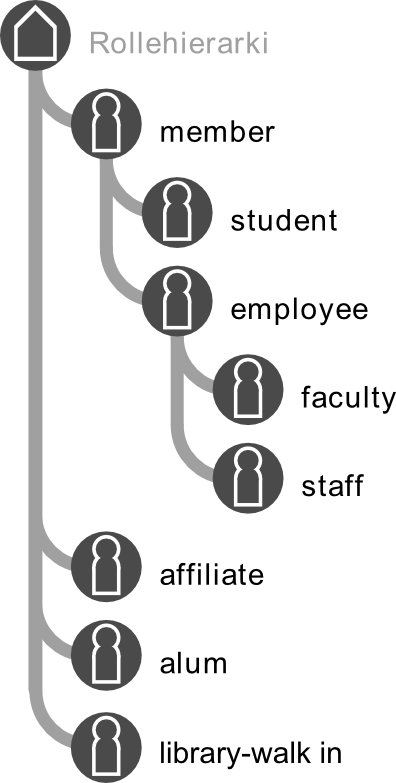 The attribute eduPersonPrimaryAffiliation gives the person’s primary role.